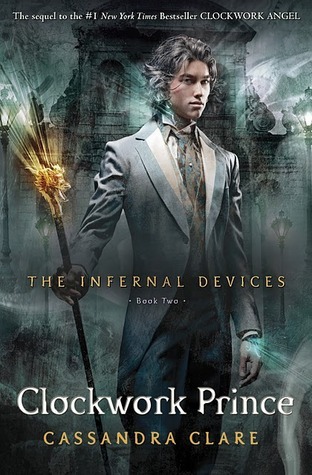 The hunt is still on for Mortmain, the man who is organizing an army of clockwork monsters to destroy all Shadowhunters, and the stakes are heating up. After the break in and loss of a Pysix, the control over the Institute hangs in the balance. The Council has ordered Charlotte and the young Shadowhunters, Will and Jem, to hunt down the dangerous man and end the terror before more lives are lost. Tessa joins the hunt even though she is not a Shadowhunter. In fact, she isn't exactly sure what she is. Not a mundane. Not a warlock. Nephilim, maybe? Finding Mortmain isn't easy, he is always one step ahead of the Shadowhunters and knows their every move. How is this possible? Relationships, past and present, are what drive this book. The story is like a who's who of downworlders, but Clare master's the third-person narrative and I was never lost. Prince has a sophistication that I didn't feel at all times with Angel. Clare's writing is always impeccable and she is a master at imagery, but Prince felt just a bit more grown up to me. The language is more complex and the plot itself takes on a more young adult role. The complicated romance between Tessa, Will, and Jem heat up. Way up! This is mostly why I thought Prince had a more young adult vs upper middle grade feel. Both gentlemen vie for Tessa's attention and she is often confused about her feelings. Who should she love, if anyone? Should she follow her heart? Who won't leave her the most devastated? It seems like both will break her heart in way or another in the end. But, she does make her choice. Only, was it the right one? Will takes on a more prominent role and we finally get to see a glimpse into his mysterious past. Scratch that, more than just a glimpse. We get a lot of questions answered and I was surprised to learn so much. Happy, yet surprised! His early home life, how he got to the Institute, and so much more was revealed. Clare takes us from being annoyed with Will and his gruff (almost mean behavior) to downright feeling sorry for the kid. I was on a roller coaster of emotions with that boy! Jem is still that trusting shoulder to lean on. Such a rock, he always puts everyone first. His illness is still in full swing and our heart breaks for him little by little. He has accepted his fate, but Will and Tessa will do anything in their power to keep him around as long as they can. He takes a big risk in this book and boy...does it pay off for him!